Welcome to Ashland’s Pool 2 Path Website! 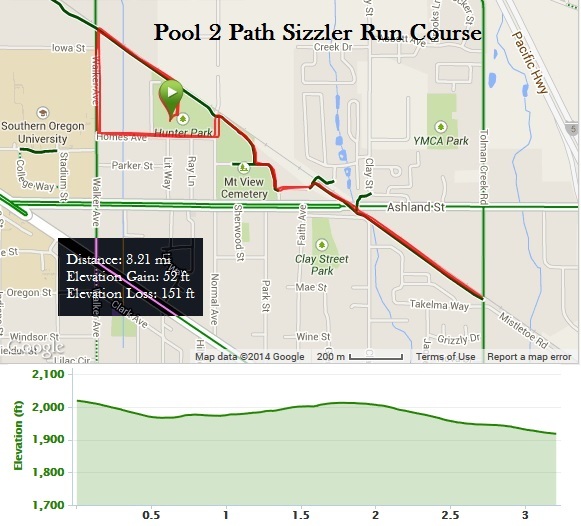 The 2018 Pool 2 Path event will be a 4-race series occurring every Wednesday evening from July 11th to Aug 1st at 7:00pm at the Daniel Meyer pool. These races will consist of a 500 yd swim (NOTE: the Ashland Parks & Rec catalog misprinted the swim as 800 yards) followed by a 5k run along the bike path. The best 3 times will be added together to come up with an overall time for each athlete. If you don’t want to swim come out and just run the 5K. Awards will be given to the top male and female finishers in each 5-year age group (20-24, 25-29, 30-34, etc.) and special awards will be given to the overall male and female finishers. A minimum of 3 races, out of the 4 total offered, must be completed to be eligible for awards. The Pool 2 Path Series is designed to be fun, relaxed and non-intimidating offering an encouraging atmosphere for beginner athletes while also providing a consistent course for those seasoned athletes wishing to track improvements or get in a speed workout. Registration will take place from 6:00 pm to 6:45 pm on each Wednesday listed above. There is no additional charge for race day registration. One event costs $15 for an individual, or you can sign up for all 4 events for $55. Team registration is allowed on race-day only and costs $10 per person. However, there will be no awards for teams. The swim portion of the race will begin promptly at 7:00pm. Assuming we can get enough volunteers, we will likely provide lap counters for those who do not have them. But it is advisable for participants to bring their own lap counters. Athletes will be seeded by estimated swim time. Swimmers will share a lane and circle swim with as many as 3 other people in the lane, depending on the number of participants. If there are enough participants that would require more than 3 people per lane, there will be additional heats. After completing the 500 yard swim, runners will exit the pool and transition to the run portion of the event. 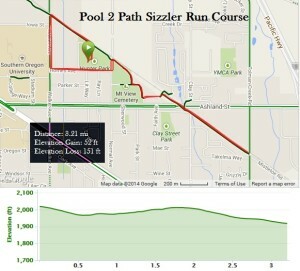 The run will be an out and back on the bike path with a small aid station at the turn around at Tolman Creek Road. There will be volunteers at key positions to aid runners with directions. But as is the case with all events, athletes should know the course and are responsible for finding their own way. Leave Daniel Meyer pool heading EAST past the tennis courts (on your left) and making a LEFT (turning north) on the bike path. Run the bike path to Walker Ave and turn LEFT (west) on Walker. Run west on Walker Ave until you reach Homes and turn LEFT again (south). Continue on Homes to Normal Ave and then turn LEFT (east). Run on Normal for only a short distance before turning RIGHT (south). Continue on the bike path all the way to Tolman Creek Road before turning around and returning back to the pool on the same exact course. Questions? Contact race director Matt Miller.